To fit or not to fit: Do car segments matter? The concept of a car “segment” is a curious thing. Mostly customers don’t know or don’t care in which segment their car competes. And in these crossover- and niche-obsessed times I get the feeling that predefined segments are becoming less and less relevant. After all, is the Dacia Sandero a competitor to the similarly-priced Suzuki Celerio, or rather the similarly-sized Opel Corsa? What about the BMW 5GT? Does it compete with the Mercedes-Benz E-class, R-class, or maybe old-fashioned minivans? Ultimately, does the notion of a segment even matter anymore beyond comparison tests and sales statistics? Yes, they do, but not necessarily as a direct source of information to the buying customer. Rather, I believe they capture the idea that, when buying cars, consumers will usually decide on which car size they want (usually by anchoring their search on the segment leader e.g. the VW Golf) and then cross-shop similar cars. And cars that don’t neatly fit into these “search sets” are often ignored, especially if they are too different from the market leader in their segment. New Audi R8: nice, but why does it look like a facelift? Even as a big Audi fan I have to admit the new Audi R8 looks too much like a facelift of the old one. What’s more, the new details disappoint, from the new hexagonal snout (too blocky, especially the thick vertical parts either side of the main opening) , the loss of the “side blades” which made the previous car more distinctive, and finally the rear lights that somehow look cheap. I really wish the front was more like the spy-shot/fan-made rendering shown below, with its aggressively thin LED lights (never really learned whether this supposed “leaked picture” was real, but it could be it was a proposed treatment for the scrapped R4 baby brother). In the late 1990’s, Nissan was Europe’s best selling Asian car brand thanks to the Micra, Almera and Primera, which were the epitome of Japanese cars in that period: not very exciting, but extremely reliable. But in the early 2000’s, they tried to bring more frivolous design into their cars with the 2002 Micra K12 and 2002 Primera P12, and as a result, the once faithful customers looking for anonymous transportation stayed away. At the same time, the newly formed alliance with Renault caused the Japanese engineers to lose their focus on bulletproof reliability, and Nissan’s sales dropped from almost 440.000 units in 1998 to just over 300.000 in 2007. Contrastingly, Toyota was growing fast, and it has held the title of biggest Asian brand in Europe since 2000, even more than doubling Nissan’s sales between 2004 and 2008. The large passenger van segment is up 5% to just over 150.000 units in 2014, with the Volkswagen T5 still firmly in the lead, selling more than double of its closest rival, the Fiat Ducato, even with the new generation T6 to be introduced in 2015. The new generation Mercedes Vito Tourer and its luxury twin V-Class (formerly Viano), would be in second place ahead of the Ducato if combined. The Renault Trafic and Opel/Vauxhall Vivaro are down as their new generations have only just been revealed and won’t start deliveries until Q2 of 2015. The Ford Tourneo Custom is up 37%, but sales of the larger Tourneo are down to less than half as customers are waiting for the new generation. Interesting to see that of the Sevel-Nord triplets the Citroën Jumpy and Peugeot Expert outsell the Fiat Scudo by a 2:1 ratio each, while of the Sevel-Sud triplets the Fiat Ducato sells 12 times as many times as the Citroën Jumper. This is a result of the popularity the Ducato enjoys among coachbuilders and most notably campervan constructors. Also not that this list is not complete, as data of some models is not available. Sales of small passenger vans are up 2% to almost 200.000 units in 2014, with the Volkswagen Caddy still firmly in first place, despite a drop of 3%. Its closest competitors, the Citroën Berlingo and Peugeot Parter are down even more. Combined, the two clones would lead the segment ahead of the Caddy. The Renault Kangoo holds on to its fourth place ahead of its distant cousin Dacia Dokker, while the Kangoo’s clone Mercedes-Benz Citan is quickly storming the charts. Ford has successfully launched the new generation Tourneo Connect, which reaches 7th place with almost 10.000 sales. Looking at the smallest vans of the segment, the aging Fiat Qubo, Citroën Nemo and Peugeot Bipper are all down with double digits, feeling the added competition from the Ford Tourneo Courier, and the triplets have lost more volume than the Ford has sold this year. 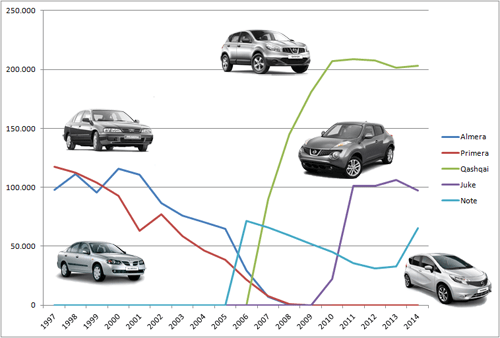 Sales in the premium large SUV segment rebounds in 2014 at +11% on its worst year since 2002 and is already back at the level of 2011 and 2012, and above 2009 and 2010. With a slew of new models hitting showrooms this year, a return to 250.000 annual sales may be within reach for 2016.